EAB Associates building and construction products are suitable for roof waterproofing, underground damp-proofing, waterproofing of internal floors and walls, joint sealing and caulking, protection of metal surfaces, and thermal insulation of surfaces. We also supply admixtures for concrete and foaming agent for making lightweight foamed concrete. Please see product datasheets below. EAB Associates is a supplier of specialist, chemically based products for the waterproofing, sealing and general protection of buildings. Our products are used both in new construction and for maintenance work. We always offer an excellent service from your initial request, to quotations, technical enquiries and the shipment and final handling of the order. We assure you of our best service at all times. We have great expertise in exporting and export to various countries, mainly in the Middle East, Far East and the Indian Sub-Continent, and work with a variety of different organisations including government bodies, testing institutions, architects and engineers, specialist waterproofing contractors, and importers of construction materials. We are able to give professional advice on most matters in the waterproofing field, either directly from our own knowledge and practical experience, or after reference to our many specialist contacts. waterproofing walls, floors and roofs in underground car parks, basements, tunnels etc. 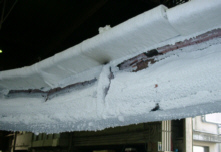 anti-rust protection of metal surfaces in exposed environments. Product specifications may change from time to time. Please contact us for more information.